My sister and I have been on a pilgrimage, searching for clues about our ancestors who homesteaded on the Upper Peninsula of Michigan just before the turn of the century. Jozefa and Herman, who emigrated from Warsaw and settled in a small Polish community, grew potatoes in the swampy, sandy soil. They experienced long and cold winters, where they measured snowfalls in feet and temperatures hovered well below zero. My grandfather, George, left the farm to work in the automobile industry in Detroit. Although the farm has been abandoned for over 70 years, town folk still refer to the homestead under our family name and directed us to drive down a dirt road to find their house. We scanned the forest on either side of the road until we spy a rooftop peeking out above the tree line. I grabbed my backpack and camera, and we began pushing through the tangled underbrush. Thorny bushes and trees with low branches poked at us as we make our way toward the house. Thin trees encapsulate the home, but we climb through a space where the back door remains slightly ajar. Paint peels away from the walls, but the floors remain intact. I can see the opening to the loft where my father told me he slept when he came to visit. Solid walls stand erect, the tin roof protecting the wooden interior. We explored all corners of the empty two rooms, and then just sit quietly on the hollow window frames. We leave the house to explore the surrounding fields and come across a pile of old timbers and cast-off pieces of metal, all that was left of the barn. Under the brush, we pulled out the pieces of a rusted bucket. 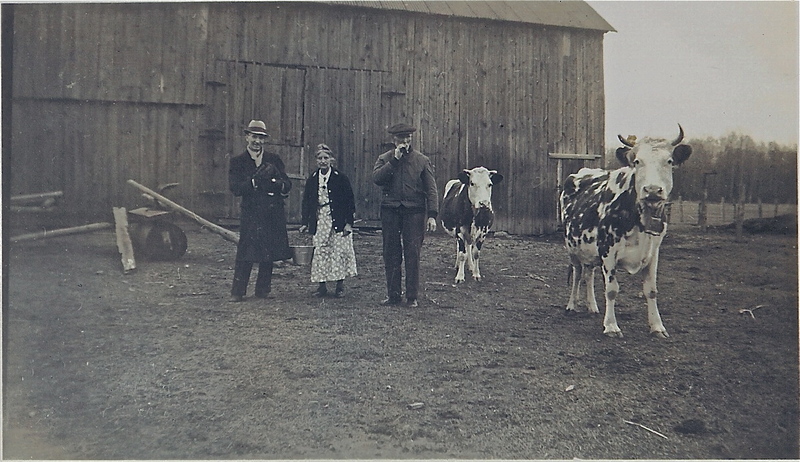 As I look at the bucket, I remembered one of the undated photographs taken of our great-grandparents’ barn. My laptop, which I carry in my backpack, holds the archives of our family history, so I begin searching for the photograph. 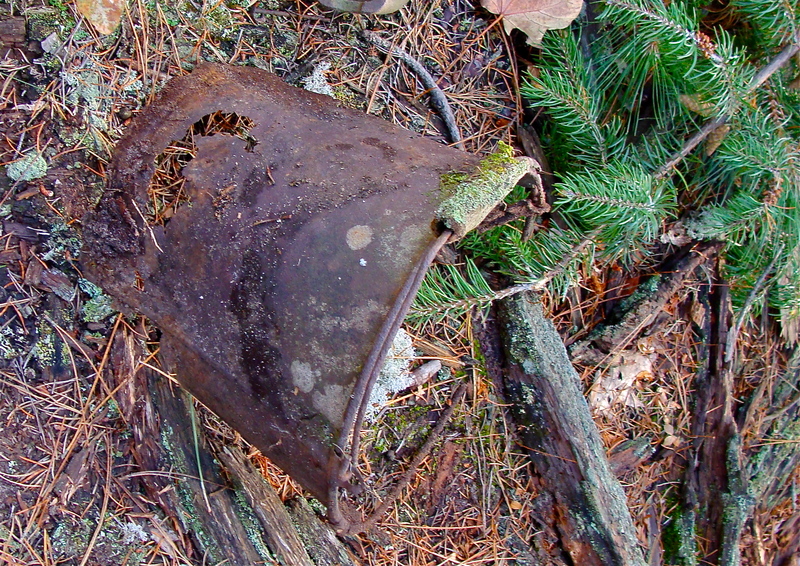 Time evaporates as I gaze at the rusted bucket and then at the photograph of Jozefa holding the pail. Grandfather, standing to Jozefa’s left in the picture, traveled almost 400 miles to visit his folks on this day. I questioned why did he make such a long trip at this time? George appeared quite dapper in his fedora and long black coat, and I noticed that he was smiling coyly at the camera. I searched back in family records again and found that my grandmother, Catherine, had died in 1936. Several years later George remarried. Was that his new bride taking the picture? This was the beginning of a new life for my grandfather, but Jozefa would have only a few years left to care for her animals and farm. I thought about her small hand holding the handle of the bucket.